When leaving a job, you may want to write your coworkers, boss, or employees a farewell message. You may also want to say thank you in your message. Writing a pleasant goodbye note may encourage others to remember you fondly. Saying goodbye is #8 on the list of 15 things to do before leaving a job. At the office, the farewell message is usually sent via email when sending the same message to a group of people such as a team or others that you had contact with. When saying goodbye to one person, such as your boss, mentor, or close coworker, you may want to write a handwritten note instead of sending an email. Handwritten notes may feel more personal, and the person is likely to keep it longer than an email. You don't have to thank or say goodbye to everyone on the list below with a farewell message. Wanting to thank someone on that list, may be what brought you to this post. So I listed others that you may want to write a message to that you may not have considered otherwise. Below are examples of personal notes written to 1 person only. Below are some suggestions for what types of things to include in your farewell note. They are followed by sections of examples notes written to a boss, employee, and coworkers. Your last day date, in case anyone wants to say good-bye to you in person (if you work at the same location) or reply to your message. Where and what your next job is. People always wonder! But that's entirely up to you. Don't share about your next job if you are not comfortable doing so. It's been an honor working with you. Usually, I recommend being specific when thanking someone. However, that is nearly impossible to do in a group email. So, your farewell note might feel generic, which is okay in this situation. Contact information, if you want to stay in contact with people! Maybe you don't. Only provide contact information if you are genuinely okay with someone contacting you in the future. If you don't want a bunch of Facebook friend invites from acquaintances, don't include your Facebook info. Social media accounts like LinkedIn, Facebook, Twitter, and Instagram. A link to your website/blog if you have one. Your note can look like the example that follows. For more information on the layout of a thank-you note, see these 5 easy steps. Your Message (this is the middle section). Note: words in [brackets] in the examples below, should be replaced appropriately for your note. The format of the farewell examples messages will be the same, so only the middle section of the note is included in the examples below when the note has only 1 paragraph. You can add additional paragraphs to any of the samples if you desire. You can also combine wording from different examples into your note. Note: This section of examples is for when you are sending one email to multiple people. Since its being sent to a group, you will not be thanking anyone for anything specific. Some of the examples will feel generic and simple. These emails are more casual and could be for a boss sending an email to employees or coworkers to coworkers. List only the contact details you want to provide. Also, feel free to send me your contact details. I'll be starting a new opportunity next week. My last day here is [Day of Week], [Date]. If you'd like to stay in touch, my email address is [your email address]. Thank you all for being so great to work with it! It's been an honor working with such a dedicated and successful group. If you haven't heard yet, I've accepted a position at [Company Name]. My last day here is [Day of Week], [Date]. Please feel free to stop by my [desk/cube/office] this week. You've been the best team I've ever worked with. Working to together on projects has been a delight. I will miss working with you. However, I'm am excited about my new opportunity with [Company Name]. My Facebook page is [link to your Facebook page], and my email address is [your email address]. We've accomplished a lot together as a team. It's been an honor working with each of you. I have enjoyed the camaraderie and consider each of you a friend. I am excited to move on to a new challenge at [Company Name]. If you want to know more about it, please let me know. Also, please respond if you'd like to stay in touch, and then we can share personal contact information. COLORFUL & WARM: Choose from 6 modern designs featuring animals, butterfly, bees and birds that are sure to leave a smile on your recipients face. PHOTO-SIZED THANK YOU CARDS: Cards are sized just right for your personal heartfelt note of gratitude and your photos. Card is 4 1/2 x 6 1/4 and envelope is 4 3/4 x 6 1/2. PERFECT FOR EVERYONE: These thank-you cards are loved by women, girls, teens and kids alike. 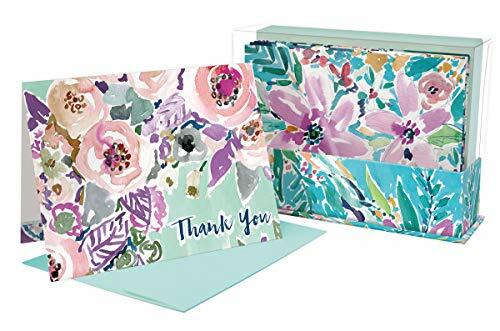 Let them know you care and appreciate them with a fun and simple note of thanks. As [Boss's name] announced in the meeting yesterday, my last day is on [date]. I am leaving with a tinge of sadness as I've come to enjoy a friendship with each of you. You've inspired me to keep learning as much as I can. Now, to keep growing, I feel that moving to a larger company will lead to more opportunities. Thank you for being a fantastic team! You've been a fantastic team for the past two years. I am grateful that I had the opportunity to work with each of you. My last day is on [date]. I am hoping we can squeeze in a team lunch before then. Also, thank you for listening to all of my cat stories! I am very excited that my next position is at the Humane Society where I can spend plenty of time helping cats. This could be done in a handwritten note or an email or even an instant message if your company uses Skype or Slack (or another messaging program). I have enjoyed having you on my team during the past few years. I am thankful for all of your contributions to our team. Your work on [project name] was outstanding and provided a great deal of value to the company. Also, I appreciate your honesty whenever I asked for feedback on my performance. Not everyone was willing to share things with me. As I start my new opportunity, know that I will miss working with you. Perhaps our paths will cross again in the future. Until then, please keep in touch! My personal emails is [your email address] and my phone number is ###-###-####. 2. Thank you for being a dependable employee. You will be missed. You were terrific and supportive with training new hires. It's going to be hard to replace you. 3. I wish you all the best at your new position. Thank you for everything you did while on my team. Your work on [project name] was top notch. You'll be remembered as one of the good ones! 4. I am sad to see you go! But I am happy for you at the same time. The new position may be precisely what you are looking for. Thank you for always being willing to help out with whatever was needed without complaining. 5. You've been an incredible support to the team and me. Thank you for all of your process improvements. Your legacy will live on here with all the macros and other tools you developed to make everyone's jobs easier. I wish you all the success in your next position. 6. Thank you for your hard work and dedication while you were on my team. [Client name] expressed many times how much they liked having you on their project. They are going to miss you too! Here is my personal email address if you'd like to stay in touch: [your email address]. 7. You will be missed! I do hope your new job provides you with what you were looking for as a next career step. Thank you for being awesome. Thank you for being the best boss I've had so far in my career. You're a wonderful listener, and I felt valued as a team member. The team events over the years have helped with team bonding. Some people will say they are a waste of time, but they were not to me. If you want to stay in my personal email is [your email address]. Thank you for all the advice you have given me. I appreciate the recommendation you gave to [new company name] on my behalf. I believe it helped me to get the job. I am looking forward to trying out [new career field]. Thank you for sharing your wisdom with me while I worked on your team. You helped me to learn that there are often many ways, not just A or B, to solve problems. I will remember that advice. I want to stay in touch. What is your personal email address? Mine is [your email address]. 4. You’ve been a great manager. I will miss working with you and the team. Perhaps our paths will cross again in the future. 5. It’s been an honor working with you. I will treasure all of the advice you passed on about [job topic]. Whoever you hire to replace me, will be fortunate to learn from you. 6. You were my favorite team lead ever! I will miss chatting with you. Thank you for giving me opportunities to learn and improve my skills in [topic/program]. It's because of you that I was able to accept the manager position at [new company name]. I appreciate all your support in my personal development. Note: it can be easy to say Good Luck. There are 100+ ways to say good luck here. These messages can be sent as a reply to a farewell message. Or if you didn’t receive a farewell note, you can still send the person that is leaving an email, if you desire. 1. I have enjoyed working with you! Good luck at your new position. 2. Thank you for all you taught me about [subject they taught you about]. My knowledge and skills improved because of the time you spent mentoring me. I wish you all the best! 3. Wow! I am excited for you. We had some fun times working together. Good luck at the new job. 4. You'll do great at your new position! Thank you for being a great friend while we worked together. 5. Thank you for everything that you taught me! I enjoyed working with you and wish you all the best in at your new position. 6. I am excited for you and your new position. I hope it works out well for you. Thank you for being an excellent teammate while we worked together. 7. I am going to miss working with you! I appreciate all you taught me about [topic]. You were a great mentor! 1. You were one of my favorite people to work it. I'm so glad we were assigned to the same team. Thank you for being so fun to work with it. I liked discussing programming problems with you and coming up with solutions. 2. Sitting next to you for the past few years has been delightful. I will miss hearing your stories and working on projects with you. You are very good at the position. If you ever decide you want to join me at [company name of new position], I will gladly recommend you. Of course, I better make sure I like working their first! I'll let you know in a few weeks how thing are going. 3. Thank you for all of your support while we worked together. I appreciate all the time you spent mentoring me when I was new. I feel like I learned more from you than anyone else. Your knowledge about [topic] surpasses most others. I'd love to stay in touch. Here is my contact information [and then provide your contact information]. 4. I'm so glad we made a connection that day in the cafeteria when you saw my cat shirt. I love talking about cats with you. You may have heard already, but my last day is [Date]. I accepted a new position at [company name]. Would you like to meet for in a few weeks? I should be settled in by then. 5. I will miss working with you! My last day is on Friday. Thank you for all of your help and support during the past year. I hope our friendship will continue once I start the new position. My contact information is: [list your contact info]. Thank you! 6. Thank you for being a reliable source of information about [topic]. As you may know, you became my trusted source during the past year. I appreciate that you were always up to date with the latest information. I am going to miss your expertise. I hope we can stay in touch as friends! My email address is [your email address]. 7. I loved working with you. Please know that I will miss you and look forward to meeting for lunch soon. Thank you for being a great friend and coworker! I hope the examples above helped you to write your farewell message! Have you ever received a memorable farewell message? Did it include a thank you? What did it say?